Location: Situated in the heart of the city, Sofia's premier business hotel offers easy access to the business entertainment and shopping districts of Sofia. The Palace of Culture Convention Hall is within a walking distance. 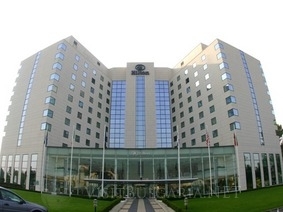 Accomodation: With 245 rooms on 8 floors, Hilton Sofia is the prefect choice of the modern traveller. Room Facilities: All of the rooms in the hotel are equipped with a PC data port, voice mail, cable TV, tea and coffee making facilities, safe deposit box and mini bar. Amenities offered in Standard Rooms and Suites: Air-conditioner, audible alarms, TV-cable, automatic door closer, coffee maker, connecting rooms, hairdryer, held shower, electronic smoke detector, electronic locks, iron ironing board, mini bar, modem, shower/ tub, secondary locking device, in bath-telephone, door viewer, telephone- with data port, telephone- auto wakeup, TV-premium HBO and CNN, trouser press, work desk with lamp. fax, sofa bed, telephone with two lines. Hilton Executive Floor: floor provides personalized service for its guests. It's exclusive lounge "Clubroom" offers and attractive breakfast buffet, an open bar and snacks during the day with a separate concierge service to assist you to conduct your business efficiently and in comfort. Food & Dining: Hilton's main onsite restaurant is called "Seasons" having 128 seats and a barbecue terrace. There is also the "Artists" Bistro with 75 Seats. Meeting Facilities: The meeting facilities include a ballroom with natural daylight and the capacity to handle up to 240 persons. The hotel has 7 Hilton Meetings rooms that handle between 5 and 30 persons, with Hilton Meetings boardroom and Hilton Meetings desk located on the Mezzanine floor. A fitness room, with state of the art equipment, swimming pool, sauna and a steam room to complete the full range of services and ensure that you enjoy your stay.